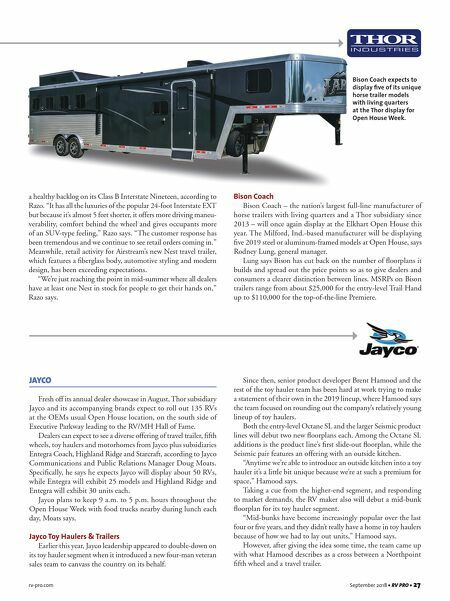 26 • RV PRO • September 2018 rv-pro.com R V M A N U F A C T U R E R S in 2010 from Fleetwood RV) and Trail Runner for this growth. Prowler is a 50-year-old brand that holds the distinction of being the No. 1-selling RV of all time. Heartland is only adding to that honor, as Prowler has become one of Heartland's top- selling brands. GM Ryan Brady says Heartland has been laser-focused on every component in this lineup to avoid price creep for 2019. He predicts, "Dealers will be ecstatic over the changes for 2019 without a substantial price rise." Among the changes are new countertop colors, new graphics, new flooring and LED lighting along the exterior frame and exterior speakers. These are designed to give a more contem- porary look and appeal to younger buyers, he says. The 2019 models are all non-slide or single slide. In all, Prowler will feature 16 floorplans, Pioneer will have 15, and Trail Runner will have 18. This is a reduction from 2018 in an attempt to simplify and expedite production, Brady says. MSRPs will range from $15,000 up to $33,000, which Brady says are in line with competing entry-level trailers. Pricing is crucial so that Heartland travel trailers can continue to appeal to the Millennial who may be a first-time buyer as well or a retiree who wants to own an entry-level RV. "Appealing to all and polarizing to none. We want to be contemporary yet classic," Brady stresses. Airstream Airstream's 2019 Classic models will feature the company's Smart Technology, which digitally connects owners to their RVs for a more enjoyable camping experience. 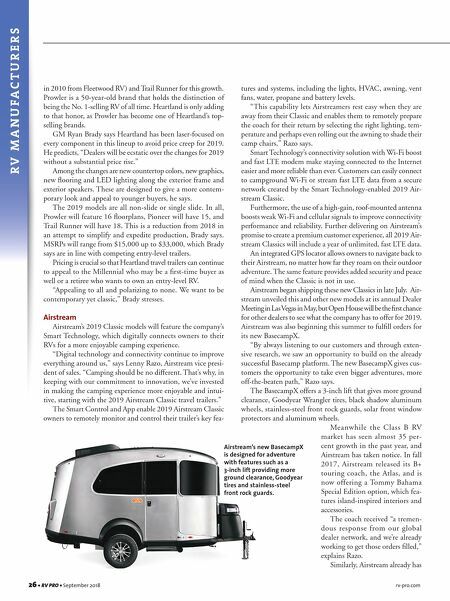 "Digital technology and connectivity continue to improve everything around us," says Lenny Razo, Airstream vice presi- dent of sales. "Camping should be no different. That's why, in keeping with our commitment to innovation, we've invested in making the camping experience more enjoyable and intui- tive, starting with the 2019 Airstream Classic travel trailers." The Smart Control and App enable 2019 Airstream Classic owners to remotely monitor and control their trailer's key fea- tures and systems, including the lights, HVAC, awning, vent fans, water, propane and battery levels. "This capability lets Airstreamers rest easy when they are away from their Classic and enables them to remotely prepare the coach for their return by selecting the right lighting, tem- perature and perhaps even rolling out the awning to shade their camp chairs," Razo says. Smart Technology's connectivity solution with Wi-Fi boost and fast LTE modem make staying connected to the Internet easier and more reliable than ever. Customers can easily connect to campground Wi-Fi or stream fast LTE data from a secure network created by the Smart Technology-enabled 2019 Air- stream Classic. Furthermore, the use of a high-gain, roof-mounted antenna boosts weak Wi-Fi and cellular signals to improve connectivity performance and reliability. Further delivering on Airstream's promise to create a premium customer experience, all 2019 Air- stream Classics will include a year of unlimited, fast LTE data. An integrated GPS locator allows owners to navigate back to their Airstream, no matter how far they roam on their outdoor adventure. The same feature provides added security and peace of mind when the Classic is not in use. Airstream began shipping these new Classics in late July. Air- stream unveiled this and other new models at its annual Dealer Meeting in Las Vegas in May, but Open House will be the first chance for other dealers to see what the company has to offer for 2019. Airstream was also beginning this summer to fulfill orders for its new BasecampX. "By always listening to our customers and through exten- sive research, we saw an opportunity to build on the already successful Basecamp platform. The new BasecampX gives cus- tomers the opportunity to take even bigger adventures, more off-the-beaten path," Razo says. The BasecampX offers a 3-inch lift that gives more ground clearance, Goodyear Wrangler tires, black shadow aluminum wheels, stainless-steel front rock guards, solar front window protectors and aluminum wheels. Meanwhile the Class B RV market has seen almost 35 per- cent growth in the past year, and Airstream has taken notice. In fall 2017, Airstream released its B+ touring coach, the Atlas, and is now offering a Tommy Bahama Special Edition option, which fea- tures island-inspired interiors and accessories. The coach received "a tremen- dous response from our global dealer network, and we're already working to get those orders filled," explains Razo. Similarly, Airstream already has Airstream's new BasecampX is designed for adventure with features such as a 3-inch lift providing more ground clearance, Goodyear tires and stainless-steel front rock guards.